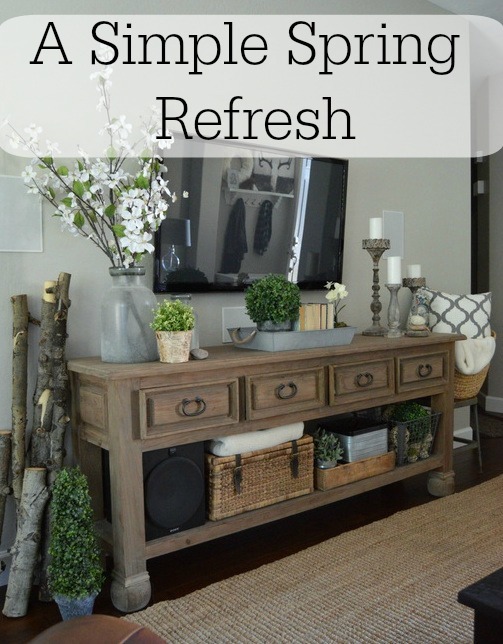 If you’ve been reading here for awhile, you know that I love to decorate my home for the seasons (check out my summer, fall and holiday tours). Spring comes early to Arizona; trees start to bud in early February, followed by shrubs and flowers in early March. I’m so grateful for our mild winters here, but the trade off is that our spring season is usually short lived. Our air conditioner is usually ”on” for the long summer season (which is fast approaching), by early May. We actually turned ours on a couple of weeks ago because temperatures were in the high nineties! Thankfully, this week and next our temps will be back down in the low eighties, and I can enjoy having my windows open for at least a few more weeks. With that being said, I love to bring spring into my home through seasonal decorations. 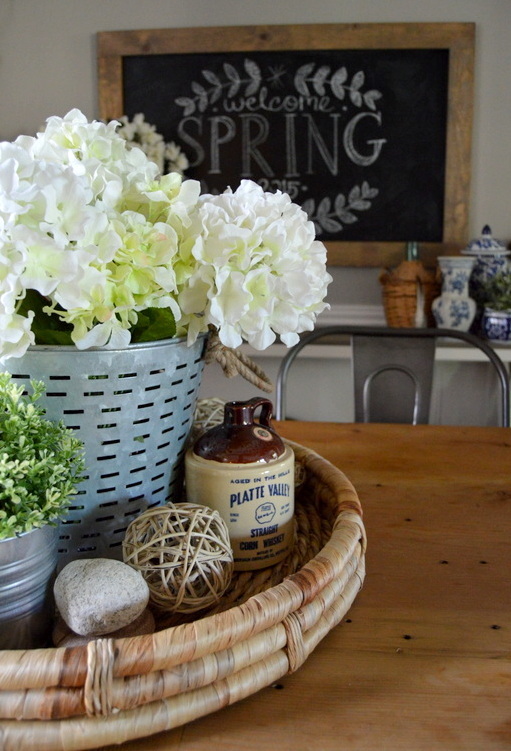 Flowers, branches, and other natural items are my go-to decorating staple for all seasons, but especially for spring. Sadly, hydrangeas, peonies, and most of my other favorite flowers don’t grow well here, so in order to enjoy them in my home, I use faux. 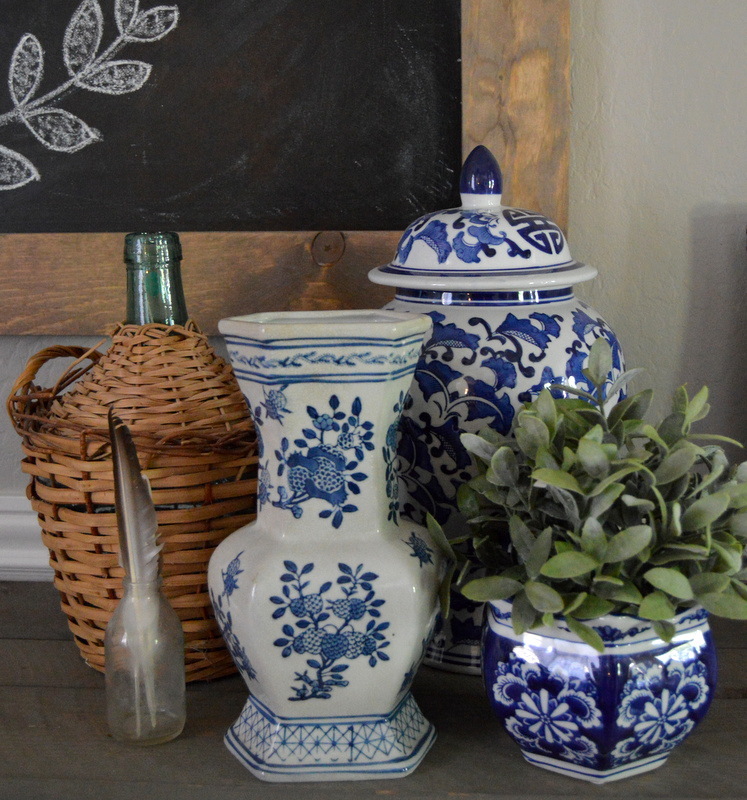 My daughter updated the chalkboard with some simple spring art work, and I brought out my blue and white pottery collection to add a bit of color to the room. I think the birch branches still work for spring, so they’re staying for awhile longer. I love the rustic touch they add to the space. I don’t usually show the room from this angle, as the lighting is a bit too tricky for my amateur skills, but I’m feeling brave today. 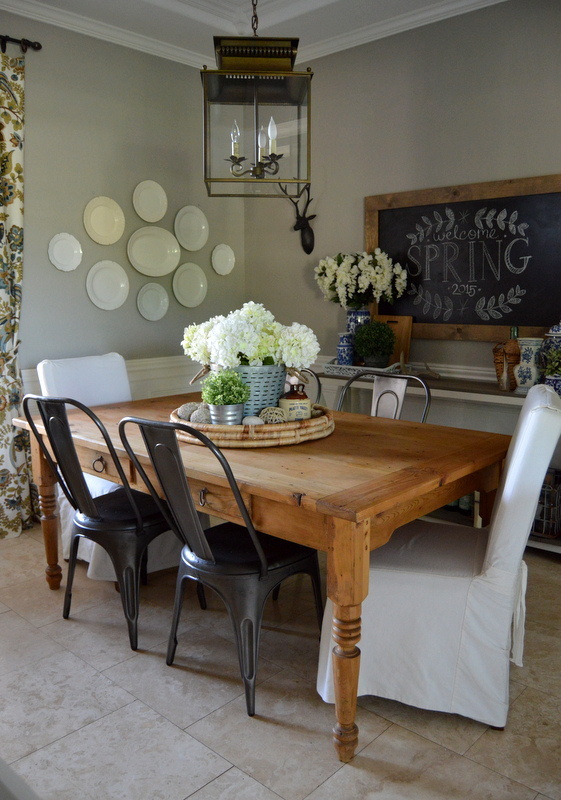 And that concludes my spring dining room tour! I hope you enjoyed seeing this room decorated for the season! Do you decorate with the seasons? What are your favorite things to use in seasonal decorating? Share with me on Instagram, Facebook, and Twitter! super job Amy, as always!!!! Love how you arrange everything!!!! 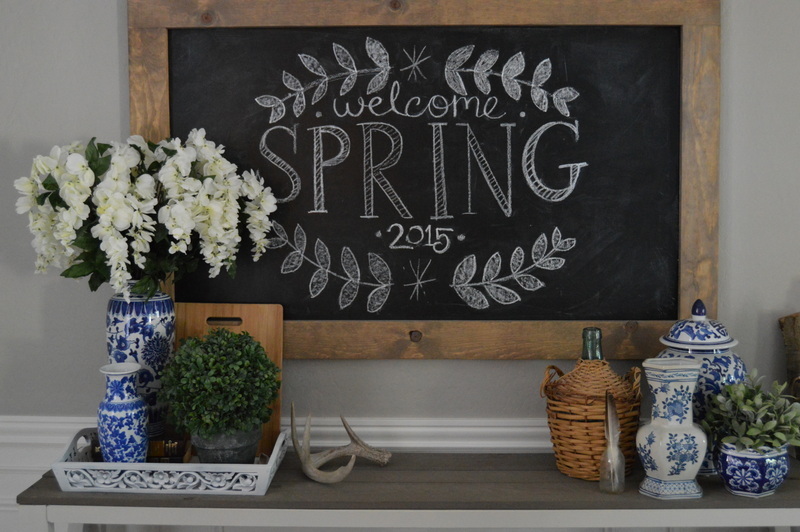 And the spring chalk board is super cute!!! It’s beautiful Amy! I love your dining room!! Your daughter has some amazing chalkboard skills! I need some tips! Hope you have a wonderful week friend! Thank you, Kendra! Yes, my kiddo is definitely an artist! I need some lessons, too! Hi Amy! I love your dining room! The blue and white vases really set it off. Thank you! I’ve had them for awhile now, but never displayed them (I love my neutrals), I’m so glad I got brave and found a place for them! Thanks so much for stopping by! Thanks so much, Sydney! My daughter is the chalkboard artist – I can’t take any credit for that one! I’m not so good at it either! 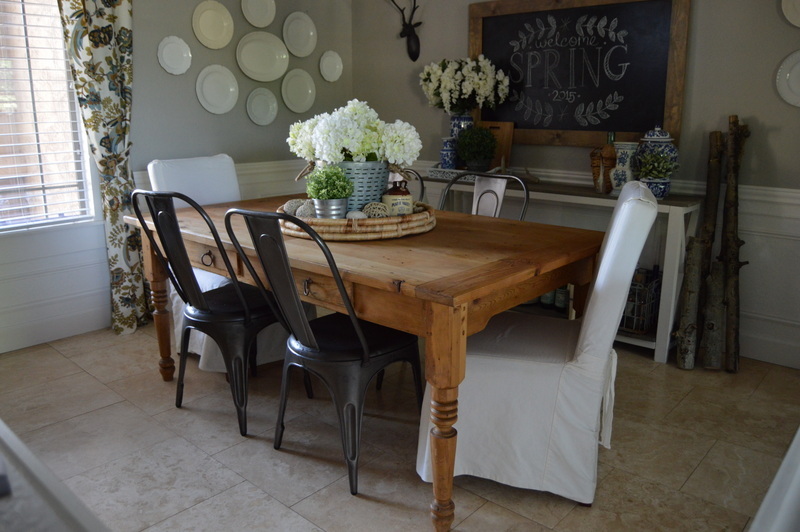 Love your Spring inspired dining room Amy! 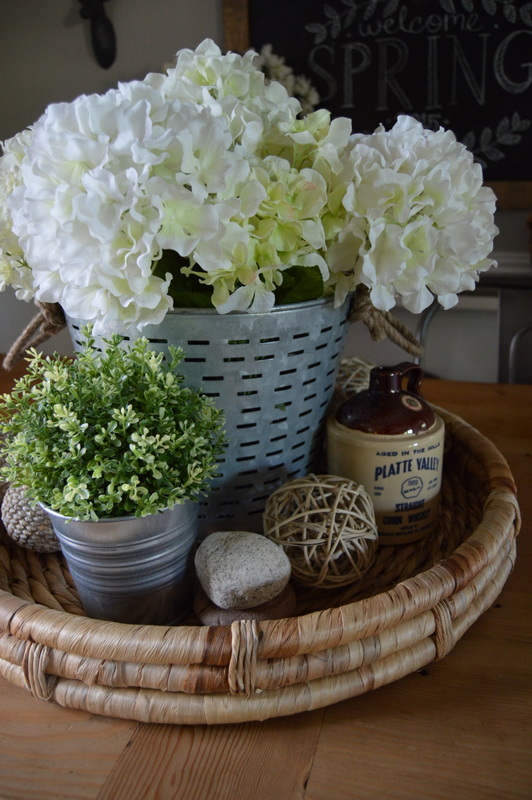 I’m a big fan of natural elements, so I particularly liked the flowers, baskets, and logs of wood. Thank you so much! It was fun decorating this room for the season! 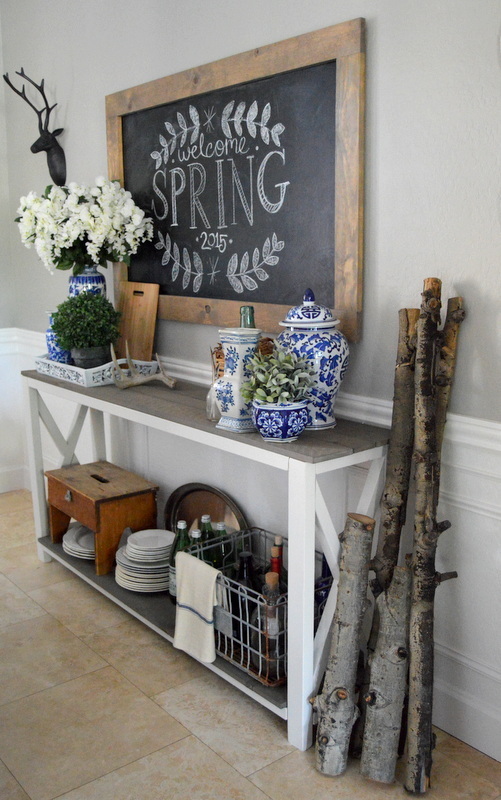 Love your spring decorating. Beautiful accents! Thanks for sharing at the Thursday Favorite Things Blog Hop! Thanks again for sharing at the Thursday Favorites Blog Hop! Hope to see you back tonight! I featured you on Tuesday Treasures. Debi recently posted…Smile – It’s Thursday Favorite Things Blog Hop! So pretty! Your styling is just perfection! Love that blue & white mixed in! Thank you so much, Karen! I’m so glad you stopped by! 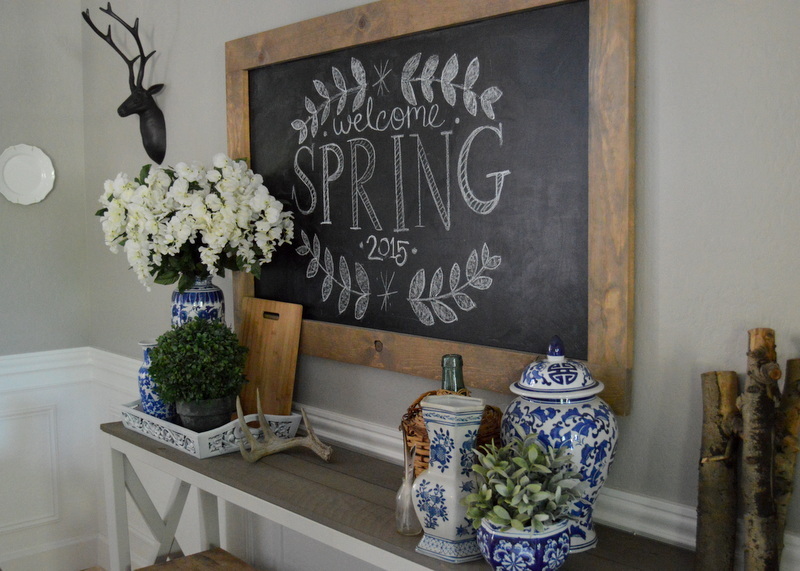 Love how you have decorated for the spring season (great looking chalkboard). Your centerpiece on your dining table is just perfect. Gorgeous! I adore your dining room. 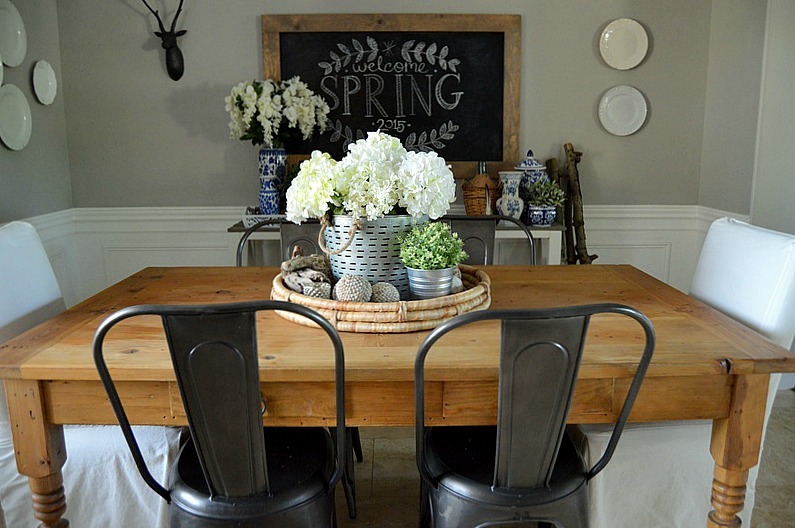 I am posting my dining room makeover this week and I just love your Spring updates. Thanks so much, Stephanie! I’m heading over to check out your dining room! 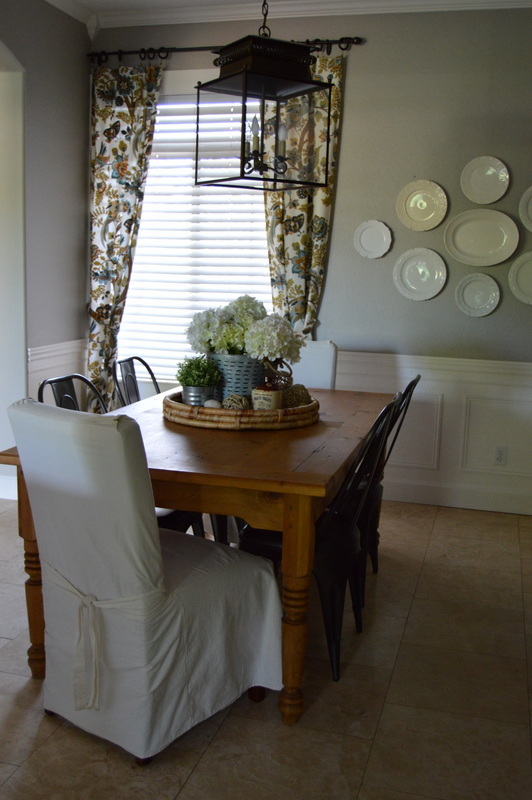 Amy – your dining room is beautiful! We love your style and decor! Thanks so much for sharing with us at Something To Talk About Link Party! I always love how you decorate your dining room, Amy! I love those hydrangeas! And your daughter is so talented, she did a great job on the chalkboard. Love that china, too! I’m featuring this at Motivational Monday tomorrow night! Thanks for linking up! Thank you for your sweet comments, Amanda – and for the feature! You are too sweet! love that dining table, where is it from? Thank you! The dining table is an antique, picked up on Craigslist. Hi. Where are your black metal dining chairs from? Thanks! The chairs are from American Furniture Warehouse. I bought mine in the store, but I believe they can be purchased online.